The response to The Correspondent’s decision to base its HQ in Amsterdam this week is a learning moment for all of us working in the membership space. The organization with the most participatory journalism crowdfunding campaign ever and one featured on The Daily Show made a decision not to open a second office in the United States, against some founding members’ expectations. This is about more than any one news organization. It’s about the fact that members anywhere can feel misled when they don’t see the trust and transparency they expect. It's also about the challenges of mass communication--and the practicalities of involving people at scale--that member-focused organizations have to navigate. There aren’t clear historical expectations for members of journalism sites about how they or site staff should behave. I want to use this reflective moment for the field of audience-funded, collaborative news to ask about alternative and advisable paths. It’s important because we’re seeing more organizations across the globe pursue these models in earnest than ever before, and there isn’t a playbook. As researchers who work for the wider industry, our team at the Membership Puzzle Project had questions for other media organizations: What steps do you take to meaningfully involve members in decisions like these? What processes and workflows do you practice regularly to be in dialogue with them? Essentially: what’s reasonable on both sides? This is quick-and-dirty anecdotal research! It's self-reported! It's solutions-oriented by design. 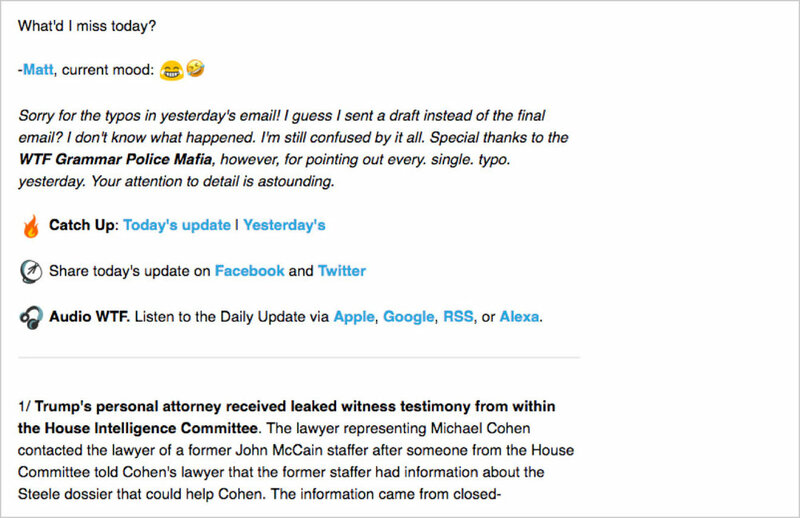 And in a participatory spirit, I asked sources to proofread this post before publishing. Some of them are soon-to-be-announced grantees of our Membership in News Fund, but I asked for their input because they’re practiced and smart. I’m a professional partner, personal friend, and ambassador to The Correspondent. I’ve interviewed their Dutch member base at length with my colleagues and examined their crowdfunding, including the things that didn’t work. I’m not deflecting attention away from this week’s situation, and my intention is not to be opportunistic. I genuinely want to know: what should organizations that rely on their members for their expertise and revenue do better? This is part of a larger, previously planned study of workflow and process at newsrooms around the world. Many organizations are grappling with these considerations for themselves, and the influx of interest in membership in journalism makes it incredibly important to get it right. Here are some news entrepreneurs’ responses edited for clarity, and emphases are mine. One of Decât o Revistă’s open “Stare de DoR” (State of DoR) meetings. “Recently at DoR we have started to consolidate the bridge between DoR as an organisation and our community, which includes paying print subscribers and event attendees. We are working to create a feedback loop with members. We haven’t had a lot of experience with putting big decisions in front of our community members before they happen, and we will be experimenting with this as we start shaping our digital offering. Face-to-face events are really important to us for establishing trust: they expect them to happen and they feel they can share their opinions on our strategies and offer constructive comments. “One of the biggest questions we will be grappling with this year is to what extent we will have exclusivity (some sort of paywall) as a benefit for digital members - we will put this question to our community over the coming months to get a more representative idea of how they view this matter. In a March 2018 WTFJHT newsletter Matt Kiser apologizes for previous typos and thanks readers who pointed them out. “As a leader, your role is to raise ideas and then allow the community to weigh in, vote, or whatever mechanism setup from the beginning for soliciting feedback and decision-making is. The key point is that you outline how your organization functions and where members of the community can engage and provide input (i.e., define the relationship model and where it starts and stops and where members are empowered and where they're not). Then you listen and either ask a refined follow-up question or make a decision and communicate it clearly. This doesn't mean that your members are the only stakeholders in the decision-making. After all, you're the one setting the agenda, framing the topics, and have the power to bring business up for discussion as you see fit. But members generally should have an outsized voice since it's their prerogative if you are worthy of their voluntary contributions. The Splice team (from left): Rishad Patel, Jacqui Park, Timi Siytangco, and Alan Soon. “I'm happy that we surveyed our community [in this way] and then acted on their feedback. These calls are scary -- you have to be ready to act on the feedback, even if you don't want to. An Outride.rs meetup in Athens. We have to consider current political and societal situations. If you run a campaign in a country which wants change in media –you should know there will be assumptions made. Leaving parts of messages out leaves room for interpretation. That is sometimes helpful but also dangerous. What is left to the imagination? In our case if we know we go into a super sensitive topic we have to be three times for more careful with communication, questions, and engagement. ‘Should we work on a story A or B?’ isn’t as useful as ‘We work on story A, we have to go to one city. We have two options: Berlin or Warsaw. Which one we should choose? Why and can you help us in this city?’ Everybody feels good exposure of the process, the seriousness of the question (they’ll actually be a part of something, not ‘What should we name our new fish in the office?’), having an immediate promise kept, and community engagement with the story. It’s a win-win. “For nurturing the harmony between members and the organisation they support, finding ways to be in tune with, empathise with, and understand members is key. Speaking with them is useful, but being like them is better (but comes with its own issues). It’s probably a lot easier to be in tune with 2,000 people living within 10 miles of me than tens of thousands of people from more than a hundred countries. We often talk with members, though not as many as we’d like to, or for as long as we’d like. Also, crucially for the Cable’s growth, we’ll need to be having more chats with people who aren’t members, so we can develop our intuitions towards their needs too. “For the Cable, asking members to participate in decisions is currently mainly done at our AGM (annual general meeting), though in the past we’ve done decision-making at members’ meetings, on an online forum, and through online polls. But doing things online, at scale, makes ‘meaningful’ much more difficult, since the personal interaction that enriches conversations is almost eliminated. 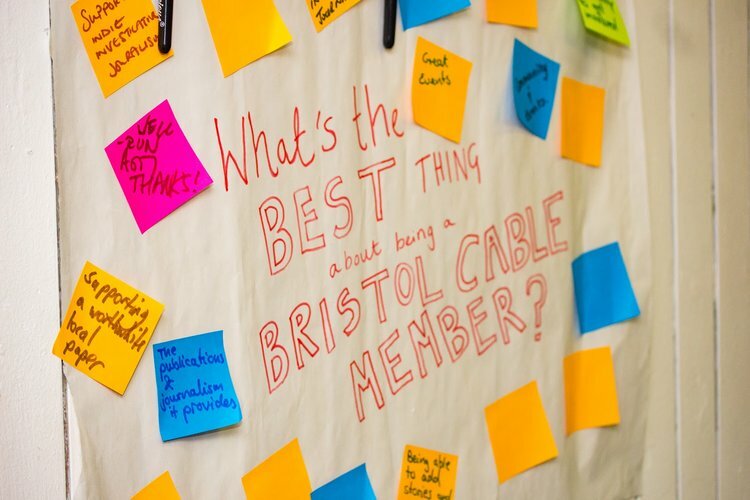 Notes from the Bristol Cable’s 2018 Annual General Meeting. “We’re still figuring out how to do meaningful online engagement. We recently ran a month-long campaign where we asked members to vote for one of two editorial campaign options, drawn from member consultation. We ran articles advocating and exploring the issues, published blog posts sharing members’ voting rationale, sent loads of emails, and we achieved 28% of members voting. It was a lot of organisational effort for a pretty simple request (though we beat our target for 25%). “Last year, due to the elections, we have suffered some criticism and actual attacks from the extreme right and extreme leftists. I decided then that I would be completely open about criticism on social media (on Twitter, mostly): I would directly answer readers (even if I didn't think they were right), I would explain our decision-making process, I would expose myself in order to show that we don't have anything to hide. “It of course generated some hatred, because people are polarized and they don't like to hear that they're sometimes wrong. However, it was mostly positive: I started 2018 with some 7,000 followers, now I have almost 20,000. I could actually hear/read more and make decisions based on our followers' impressions about Aos Fatos' work. It was time (and mind) consuming, but it was important. The outcome is that people felt heard, and not by a customer service attendant. Part of the Coda Story team. “I suspect this may be a really good opportunity to shape the relationship with the members and also define the boundaries of their power. I think it’s possible to successfully explain to the members that a collective as large as this cannot be in charge of business decisions, however if thinking behind these decisions is communicated before they are taken and members feel like they are part of the debate that might help. Letting members know before a decision is taken, letting them on the inside of the decision-making process while owning the decision, is the lesson I learn from this. Thanks to Ariel Zirulnick, Jay Rosen, Jessica Best, Greg Allen, and Katharine Quamby for collaboration and suggestions. Lukas Kouwets, Leon Postma, Aldana Vales, and Gonzalo del Peon helped with images.